NEW YORK -- With the holiday shopping in full swing, major department stores like Saks Fifth Avenue have once again turned their window displays into celebrations of the season. The tradition dates back to the late 1800s when the availability of plate glass windows allowed retailers to build large windows to display merchandise to draw in customers, giving birth to "window shopping." And during the holiday season, store owners in New York City traditionally put on magnificent displays to celebrate the season. Saks Fifth Avenue spent the last 12 months and thousands of hours creating this year's holiday windows and producing its annual light show entitled Land of 1000 Delights. The theme is an enchanting landscape of colorful candy and festive fashion. Jumbo swirl lollipops, whipped cotton candy and mounds of rock candy are seen throughout each store's visual displays. 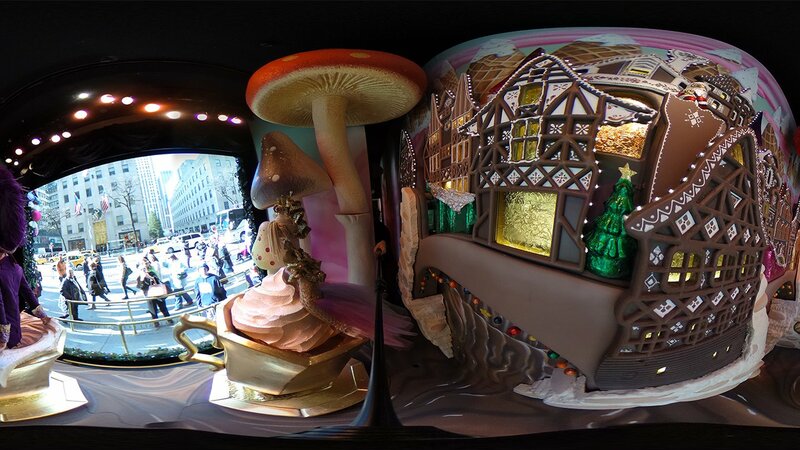 Saks' animated center six windows along Fifth Avenue, dubbed The Nutcracker Sweet, boast wondrous scenes of Clara and the Mouse King amongst a luscious wonderland. A series of "Candy Couture" bespoke dresses from Erdem, Carolina Herrera, Marchesa and Jason Wu appear in the 49th and 50th Street windows. Each one-of-a-kind dress is inspired by a favorite holiday treat, including cotton candy, peppermint sticks, and cake frosting. In the evening, the building's faade is illuminated by a multicolored ten-story tall light show, plays every ten minutes between 5 - 11 p.m. The show continues until January 2, 2017.